Science-Trees change through the seasons. Go on a nature walk in the winter and collect branches. Look at the silhouette of the tree, we called it the "Tree skeleton" and saw how they were mostly made of the letter "V". 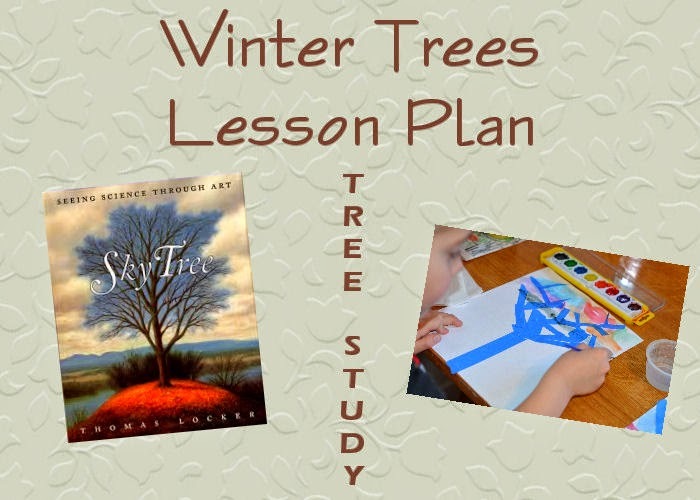 We sketched some "tree skeletons"in our nature notebooks, and read a books on shapes of trees in winter and trees in different seasons. Main Book- Sky Tree: Seeing Science Through Art by Thomas Locker. This is a beautiful book that goes through the seasons of a tree with words accompanied by gorgeous paintings. I highly recommend it being in your personal library. Make Tree silhouette with painter's tape, then water colors over the top. Remove tape when dry. Contains affiliate links. No extra cost to you, I just receive a small percentage of your purchase.